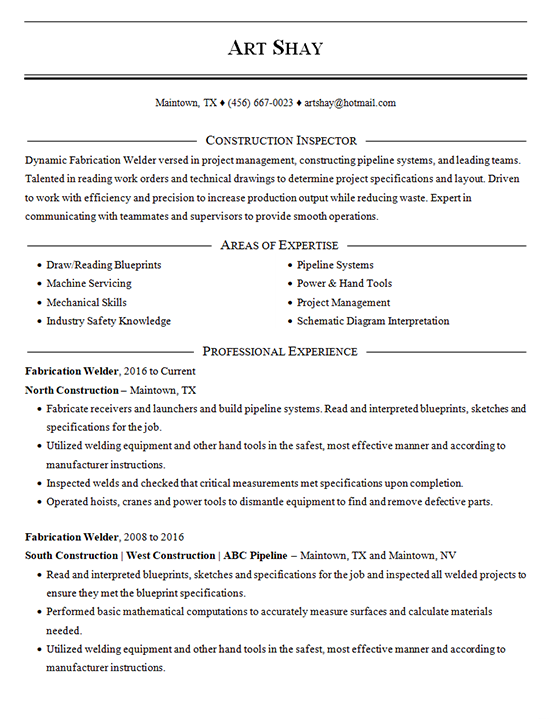 Resume template for construction worker with history as a fabrication welder and inspector. Dynamic Fabrication Welder versed in project management, constructing pipeline systems, and leading teams. Talented in reading work orders and technical drawings to determine project specifications and layout. Driven to work with efficiency and precision to increase production output while reducing waste. Expert in communicating with teammates and supervisors to provide smooth operations. Fabricate receivers and launchers and build pipeline systems. Read and interpreted blueprints, sketches and specifications for the job. Read and interpreted blueprints, sketches and specifications for the job and inspected all welded projects to ensure they met the blueprint specifications. Performed basic mathematical computations to accurately measure surfaces and calculate materials needed.